The picturesque harbour at Gaios. Just a few miles south of Corfu lies the islands of Paxos and Anti-Paxos. Of these, only Paxos is permanently inhabited and is the smallest of the inhabited Ionian islands (Kefalonia is the largest). Both Paxos and Anti-Paxos are popular destinations for day-trippers from Corfu. Paxos, often referred to as Paxoi or Paxi, offers visitors a rare and genuine slice of the unhurried, tranquil and traditional Greek lifestyle. With a hilly terrain clad in dense olive groves and surrounded by a rocky coastline lapped by crystal clear turquoise waters, Paxos really is an island paradise and is aptly described as "nature's little wonder". With the island being just 19 KM square, Paxos has an intimate charm that has escaped the blight of mass tourism. If you crave peace and quiet or feel the need to retreat from the hustle and bustle of modern day living, Paxos proves to be the ideal 'get away from it all' destination. Paxos has many small villages and hamlets to explore with the main three being Lakka in the north, Loggos on the north east coast and Gaios, the island's capital, midway down the east coast. Gaios is the largest and liveliest of the three main villages on Paxos, with a good selection of restaurants, tavernas, coffee bars and shops to be found in the many streets that lead from the Venetian main square. The tourist shops in Gaios stock a wide range of surprisingly high-quality goods, including pottery and jewellery. Lakka enjoys a naturally beautiful setting at the back of a horseshoe shaped bay. Like Gaios, Lakka is very popular with the yachting fraternity and many yachts and motor cruisers can be seen moored in the pretty harbour, giving the setting an air of elegant sophistication. 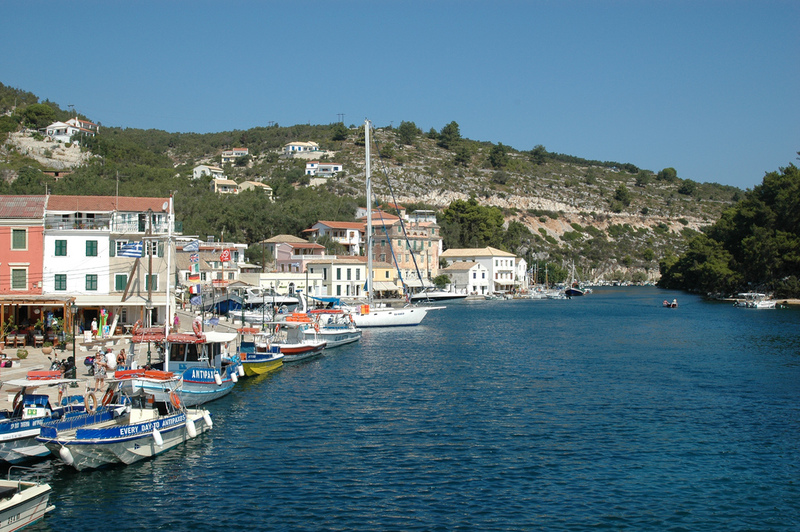 Loggos is the smallest of the three main villages on Paxos. However, this is one of the most charming a picturesque Greek villages that you could imagine. The small harbour at Loggos is surrounded by steep banks that are clad in olive groves and cypress trees. Find out more about these fabulous little islands at our sister website: Visit Paxos.